What is Flow Management Technology (FMT)? By viewing the organization as a total flow system, analyzing disruptions, the effects of Murphy's Law, and applying the principles of fluid dynamics and systems control (as in hydraulic systems), Flow Management Technology breaks boundaries as well as bottom line performance! The basis of Flow Management Technology is viewing the entire organization as a flow system — from marketing and sales; through order receiving, engineering, purchasing, vendors, and production; all the way back to the customer. It is an extremely dynamic environment where chaos constantly appears due to Murphy's Law, a multitude of disruptions and variations, causing moving bottlenecks, fire fighting, late deliveries, excess inventories, etc. In order to overcome the cumulative effect of chaos, Flow Management methodology analyzes processes in the organization using Pareto principles and statistical techniques. This allows focused process improvement that dramatically increases resources' output and asset utilization. As in hydraulic systems, key control mechanisms are built into the process; flow valves to control the flow through the pipeline; reserved capacities and strategic buffers to act as shock absorbers and flow accelerators; and a variety of feedback control loops to monitor lead times, inventories, and customer deliveries. As a result, performance is shifted to a new dimension—throughput increases in order of magnitude while inventory, lead times, and cost are reduced simultaneously without increased capital expenditure . Bottlenecks are eliminated, their associated fire fighting disappears, and a new level of flexibility and customer service is achieved. In addition, by understanding product velocity and the organization's hidden capacities, a new business decision-making tool is introduced to identify profitable opportunities that are overlooked by current accounting systems. For example, a losing product as viewed by cost accounting could, in reality, be proven profitable when properly viewed using a flow perspective. Flow Management Technology applies to all organizations regardless of type, size, product or service. It is a powerful and well-proven technology that has helped small and large organizations reduce costs and improve their performance by 30% to 50% within less than a year. The technology coupled with its implementation methodology is not another version of Just In Time (JIT) or Lean manufacturing or a software system (like ERP). Using the power of flow physics, it takes any process and makes it much "Leaner", more efficient with a lower cost. 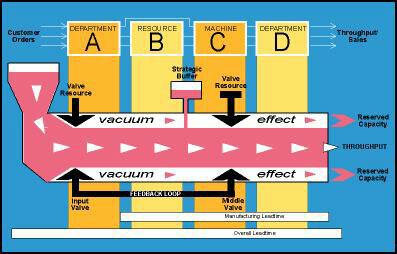 FMT uses Flow Tube Analogy to develop a simple Business Flow Model for achieving tight control, quick reaction and robust performance.